My mate Jeff won a bid on a few parts on Ebay last week, by one of those flukes, turns out the seller owns the first drag bike Jeff built back in the eighties, the bike that Jeff was slowly acquiring parts to replicate one day. Its been changed a bit over the years, it now has a 250cc engine, a Wade supercharger, an air shifter, hydraulic clutch and a different tank and seat etc. The home made frame and handmade yokes (the first he ever made) are still the same as is the front end. Well, turns out the chap was happy to sell, so we brought it home along with a pile of spares. 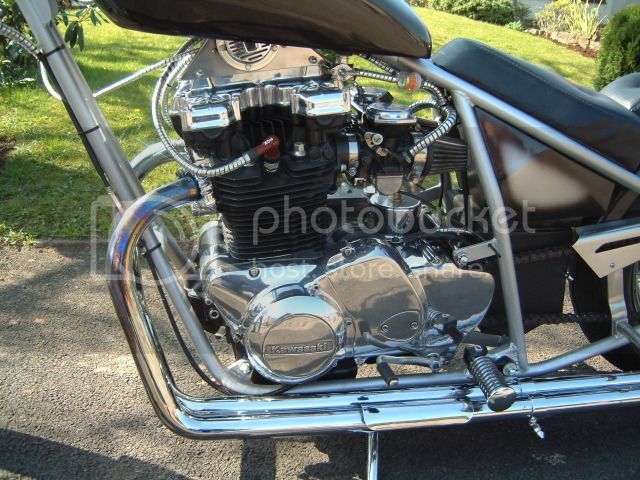 Including a half completed engine, which Jeff had started to build when he sold the bike more than twenty five years ago. This spare 350cc engine has a much stronger home made three speed box, built by Jeff using CB750 parts, as running it on Nitro used to break the standard box regularly. Its in poor condition so its being rebuilt with a lot of changes, which I'll no doubt be roped in to help out here and there, be interesting to see how it turns out. The old supercharged we took off Jeff's drag bike has a date stamp.. it was made 06/01/1943... what's interesting is that its original use wasn't on an engine, but to pressurise the cockpit of an aircraft, it would've been fitted to either a DeHavilland Mosquito or Supermarine Spitfire photo-reconnaisance aircraft. By the end of the first day the bike was totally dismantled, with plans to make quite a few changes. The rear Astralite wheel was deemed too narrow and was soon sold on Ebay, as was the Supercharger (pity I would've liked to keep it). A wider Astralite was bought but had to go back as its condition wasnt as advertised. In the meantime a scrap Japanese 3 spoke rear wheel would have to do. The points / coil ignition will be replaced by a Lucas Magneto, while the rusty fuel tank will be replaced with an alloy one which will live behind the headstock under the top tubes. We have a new supercharger to fit, along with this empty case which will be used for setting up, along with a manifold and bigger SU carb. The Pistons in the background are from a Yamaha XJ650 Turbo and will give a cc of just under 350cc and a low CR of 5:1 using a plate beneath the block. Jeff had been given a rear wheel with a knackered hub which was dusted down and put to use. The wheel came from a newish Suzuki which had a new tyre fitted (dunno where yet).. a week later on the motorway, the rear wheel bearings collapsed. When the wheel was inspected, the bearings and hub had disintegrated, because the bearing spacer was missing. I would have thought that wheel was good for nothing but weighing in for scrap, but not to Jeff.. He machined up new plates for the bearings and had them welded to the wheel. There's no need for a cush drive and the sprocket needs spacing out to clear the tyre, so all in all it worked out ok. Then again if another nice Astralite turns up, the Jap wheel wont make the final build. I did my bit by grinding off the casting marks, the wheel centre will be painted gold and the rims polished when we get time. If you know the reg number you can check online to see if its taxed or sorned. I have all the old BSH mags, if you know roughly when it was featured I could probably find the article.